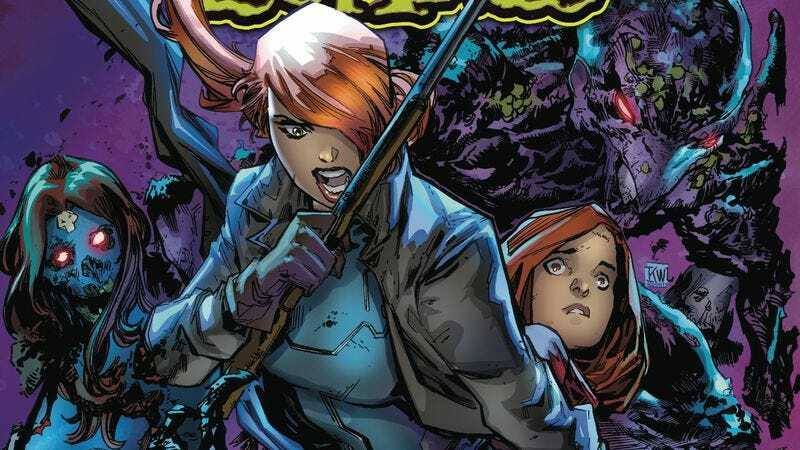 In the pages of Nextwave, Warren Ellis and Stuart Immonen established Elsa Bloodstone as one of the premier badasses in the Marvel Universe, and she’s been given the opportunity to let loose in Marvel Zombies, a Secret Wars tie-in that strands Elsa in a territory overrun with zombies. Her only ally is the young boy she feels mysteriously obligated to protect, and writer Simon Spurrier and artist Kev Walker have used that core relationship to make this miniseries the Marvel Universe version of Cormac McCarthy’s The Road, following an adult and child as they make their way through a dangerous, desolate environment. Granted, this is still a superhero comic, so it’s not quite as dour as McCarthy’s novel, and the creative team significantly lightens up the mood by bringing Deadpool to the party, revealing that the zombies have been gaining intelligence by feasting on the wacky mercenary’s regenerating brain. This preview of next week’s Marvel Zombies #3 showcases Spurrier’s strong handle on Deadpool’s scatter-brained dialogue, introducing humor that contrasts well with the dark intensity of Walker’s artwork with colorist Guru-eFX. (Special shout-out to letterer Clayton Cowle’s for his spork-shaped word balloon when Deadpool mentions the zombie’s utensil of choice.) It’s a moment of calm before Elsa unleashes her fury on her undead enemies, and given her reputation, the Marvel Zombies should be very, very afraid.